In any sustained period of food hunger and famine, children are one of the most vulnerable groups in terms of disease and mortality. 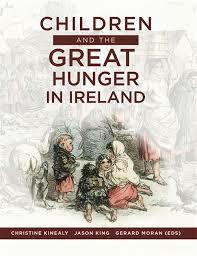 The Great Hunger that occurred in Ireland between 1845 and 1852 is no exception. This publication explores the impact of famine on children and young adults through a multi-disciplinary approach. It includes research from some of the leading scholars in the field. Children and the Great Hunger in Ireland breaks new ground in its emphasis on the experiences of children during the Irish Famine. It features a diverse range of sources and eyewitness accounts, together with new methodologies, that attest to the Famine’s devastating impact on young people. This book asks: how did children experience—and survive—the tragedy that unfolded in Ireland between 1845 and 1852? Children and the Great Hunger in Ireland brings together the work of some of the leading researchers in Irish studies, with new scholarship, methodologies and perspectives. This book takes a major step toward advancing our understanding of the Great Hunger. Christine Kinealy is Director of Ireland’s Great Hunger Institute at Quinnipiac University. Jason King is Irish Research Council Postdoctoral Research Fellow, National University of Ireland, Galway and Gerard Moran is an Emeritus Researcher at the University of Galway.